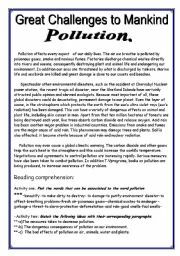 Pollution.Reading comprehension: many activities (2pages).Hope you like it. 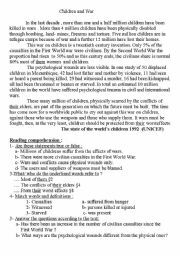 A reading passage about children and wars.Many comprehension and grammar activities.Topics for writing. Expressing cause/result relationship using �so� and �such�. 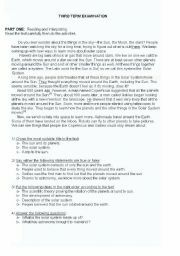 Graded activities.The students should be able to draw the rule after doing the first activity. Gap filling,combining,matching halves,rephrasing,completing sentences. Text: Child labour.Reading comprehension and various activities related to the topic. 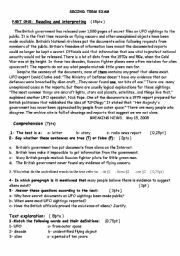 Test: UFOs. 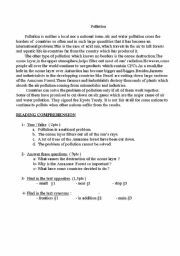 Reading comprehension, grammar, vocabulry, topics for writing , all related to the theme. 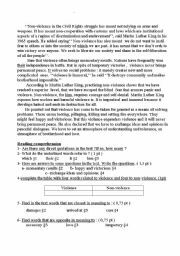 A good text to teach our children the importance of non-violence in society. 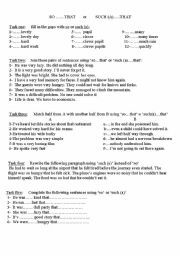 Activities : comprehension, grammar, vocabulary and topics for writing. 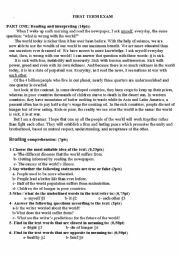 A text about poverty, insecurity in the world. It ends with the hope to have peace, tolerance....someday! Many reading and language activities and topics for writing. A reading passage and many graded activities: true / false, questions, ordering sentences according to the text, finding synonyms, rephrasing, gap filling,....and topics for writing. 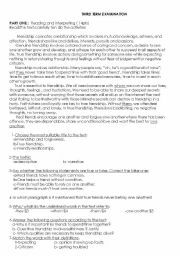 Fiendship:a reading passage with comprehension activities, grammar, jumbled sentences,vocabulary and topics for writing. An interesting text for teens: causes and effects of pollution. True/false, questions, grammar, vocabulary.